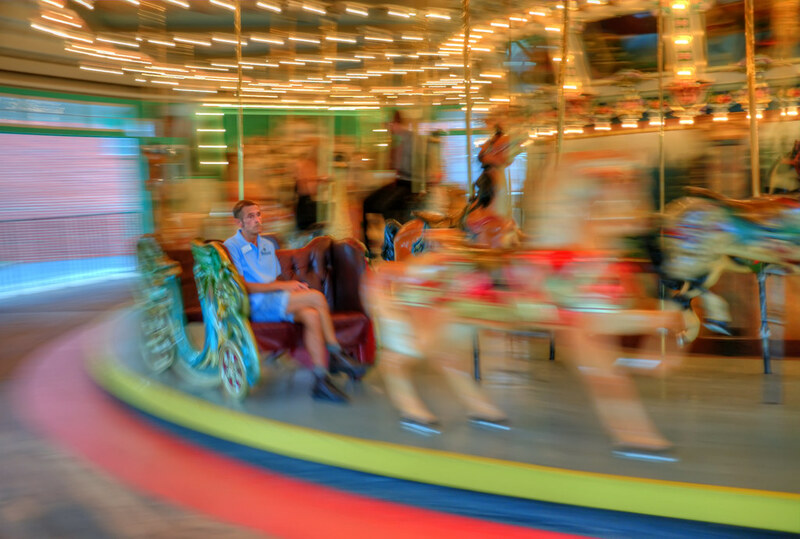 The man in this picture was actually the operator of the merry-go-round. He seemed to be in generally good spirits while admitting the other riders, but once the world is flying by in front of your eyes, who knows where one’s thoughts will go? I imagine you’d find this same gaze on dozens of passengers staring out the windows of any given train, but the context of this scene adds meaning through its juxtaposition. This was tough to shoot because of the slow shutter speed and the motion of the ride, and it’s mostly luck that I was able to get the timing right to capture his expression. Even then you can see that his feet and legs are blurring, although I find that works favorably for this image as it seems he’s becoming a part of the ride itself. After a few minutes of wandering around the World War II Memorial on the National Mall I thought I should get a photo of the section for my home state. 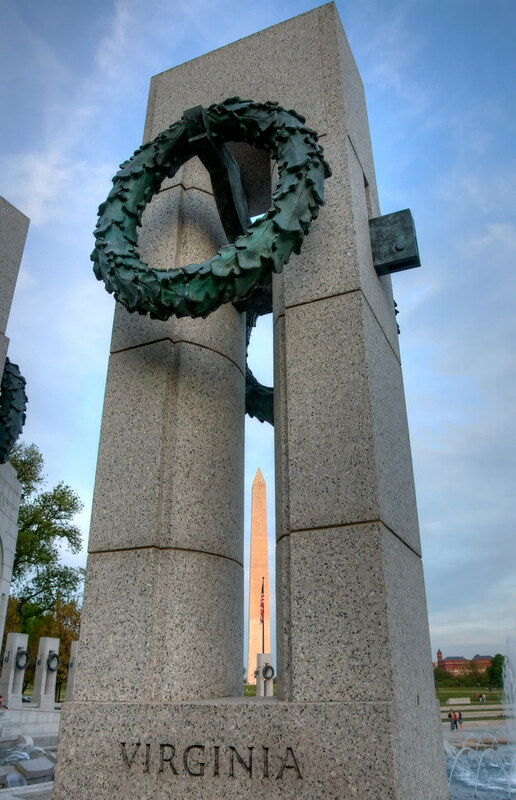 When I finally found it (I started searching the Memorial in the wrong direction, and made 4/5 of a full circle) I was pleasantly surprised to see that the Washington Monument fit directly into the center of the pillar. I’ve always been visually drawn to natural framing and I thought this added to the patriotic feel of the shot. The Virginia section is on the “Atlantic” side of the Memorial, and let me tell you, that’s where I’d want to be as well. Not that there’s any particularly good place to be in a war, but based on my recent viewing of HBO’s The Pacific, I can state with great certainty that I’d have rather been fighting in Belgium than on Peleliu. While I was processing this photo I kept zooming in on the mother duck and wondering why she looked so much sharper than her young. After comparing this with a few other pics, I figured out the problem: it wasn’t that the ducklings were out of focus, they’re just that fuzzy in real life. 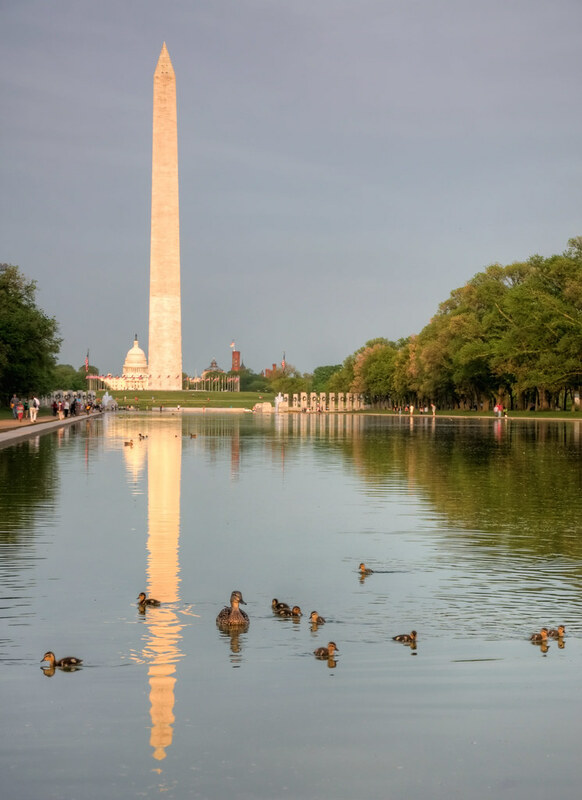 This adorable little flock paddled around the Reflecting Pool for a while and then hopped out onto the side. Where they were headed, I have no idea. It didn’t look like these tiny fledglings could fly yet, so did they all waddle their way to the Potomac or was this their permanent residence? If the latter, I’m sure the ubiquitous hordes of tourists keep them well fed. When I walked through this scene it immediately reminded me of Seurat’s A Sunday Afternoon on the Island of La Grande Jatte – 1884, which is probably the most famous example of the pointillism style of painting. It’s interesting to think of how this type of social gathering is so timeless that we can relate to it now just as easily as when his painting was made over a hundred years ago. 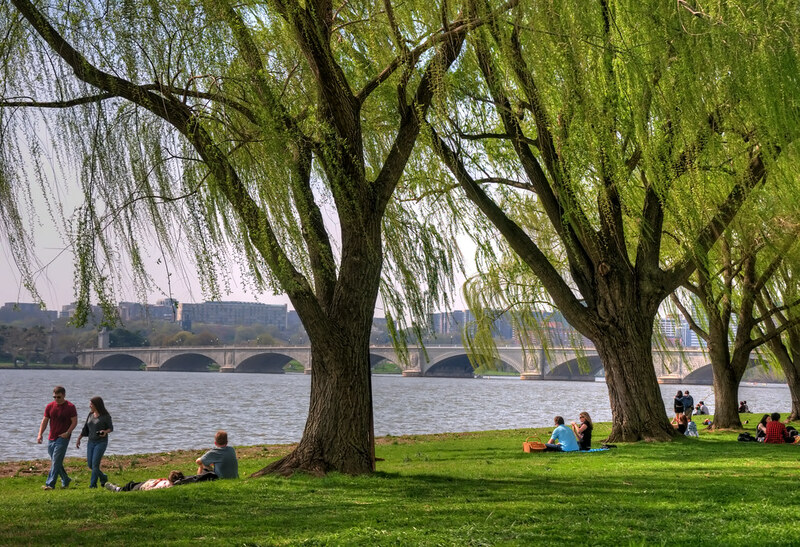 And no wonder it’s so popular; while these people were enjoying their afternoon in the open grass I continued on towards the cherry blossoms and soon found myself muscling my way through crowds of tourists around the Tidal Basin, all of us battling for space on the narrow walkways flanked with mud on both sides. Clearly sitting by the water was the better option! 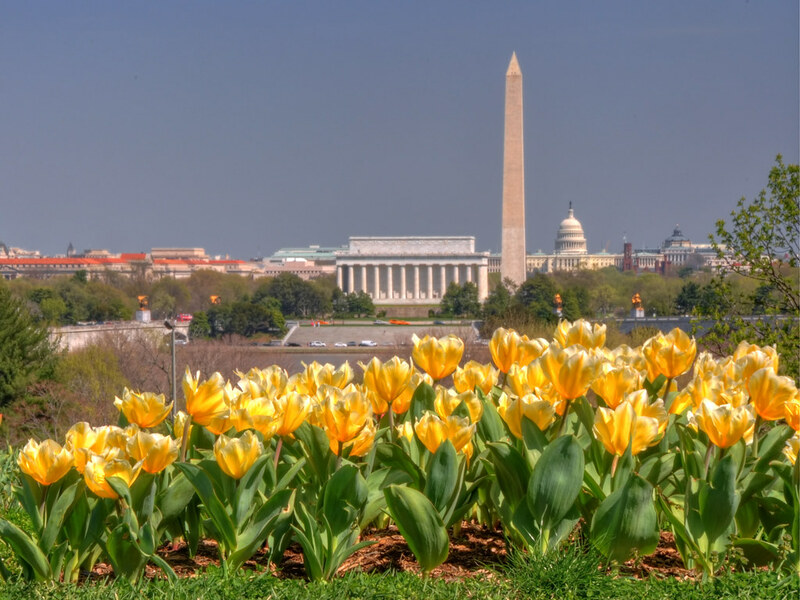 Astute readers of this blog will notice that the monuments below line up the same way as they do in this picture; both photos were taken around the Netherlands Carillon near Arlington Cemetery, albeit in different seasons. Of course no gift from the Netherlands would be complete without tulips, so the Dutch were kind enough to plant a small field of them around the site when it was constructed in the late ’50s. I can only imagine what Holland looks like this time of year! Technical note: this is the first picture on the blog shot with a polarizing filter, which helped darken the sky and increase its contrast with the buildings. Prints – A couple people have asked me if I have prints of my photos available. As of today I’ve started hosting a bunch of my work on Imagekind, a site that handles print sales and framing. I’ve used them before to have a photo printed as a Christmas gift and was really pleased with how it turned out, so I can definitely vouch for their quality and service. You can check out the gallery here.